Do you like travel? Maybe the only downside of travel is the fact that it is boring to spend much time in the waiting room, on the train or plane. Certainly, you could rest and sleep in this case or seize such time to know more about your travel destination. What if you still feel bored? It couldn't be a better idea to watch a movie with your PDA to make the wait time more enjoyable. Personal Digital Assistant, officially abbreviated PDA, also known as a palmtop computer, is a mobile device originally acting as a personal information organizer. Nearly all current PDAs, employing touch-screen technology, include high-end features like web browsers and portable media players with expandable memory, offering users with convenient visual experience. Despite the great improvement, the fatal weakness of PDA lies in no DVD drive, preventing users from directly playing DVD movies on it. Then, how to import DVD to PDA for watching? Do you feel that you can do nothing but nail-biting? As a matter of fact, the problem can be solved easily as long as you have a specialized DVD ripper for PDA, helping you convert DVD to videos PDA recognizes, say H264 and MPEG4. With numerous favorable comments from the users, MacX DVD Ripper Pro can be considered as one of the best DVD to PDA rippers. Built in up-to-date core technologies, this prominent DVD software enables users to rip and import DVD movies to PDA on Mac and WIndows as easy as winking. What’s more, the popular software also offers an outstanding ability to rip protected DVDs, no matter the new Disney DVD Copy Protection or the general CSS encrypted DVDs, Sony ARccOS protected DVDs and all region 1-6 commercial DVDs. After free downloading this software on Mac, import DVD by clicking "DVD Disc" button, or you can upload DVD disc by hitting "DVD Folder" button. For the sake of importing and ripping DVD movies to PDA, click the "to PDA" bar from the drop-down menu and then choose the most appropriate output format from the secondary pop-up bar. 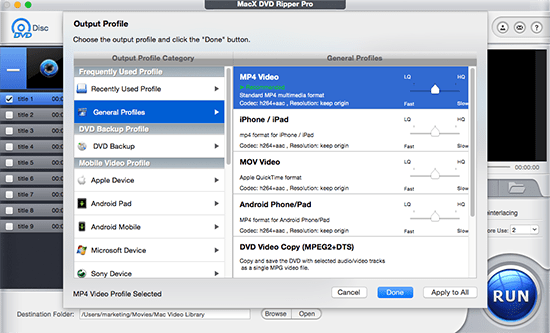 Tips: With more than 283 optimized output profiles, this DVD ripper for PDA also provides superb performance to rip and import DVD to iPad Mini, HTC, Samsung S7/S6, Android, etc, with high speed and utmost video quality, while letting you crop off unwanted black bars, combine video files, add external subtitle, etc to make stylish video. Click the "RUN" button to start ripping. After the conversion process is finished, you can import the converted movie to PDA via USB for handy playback. For iOS users, you need a file transfer tool like iTunes. MacX MediaTrans is recommended to use if you are tired of iTunes, which can sync the movie file to iPhone iPad etc. with No.1 fast speed. By the way, MacX DVD Ripper Pro installs and works like a magic. Its wizard style interface offers a unique experience for beginners and professionals. For Windows users, you can download Windows version on PC to meet your need. How to convert DVD to Android tablet without any problem? This tutorial gives you tips and tricks to rip DVD movies to Kindle Fire HD, Amazon Nexus 7, Samsung Galaxy Tab, etc with a professional DVD to android tablet converter. Do you wonder how to play DVD movies on Samsung ATIV Tab for watching them on the go? This tutorial shares the simplest way to copy and rip DVD movies to Samsung ATIV Tab with top image quality.